One look at the profile of today's daunting Stage 11 through the Alps would have told you that this could be a defining day in this year's Tour de France. The 148 km (92 mile) route from Albertville to La Toussuire-Les Sybelles began right out the gate with a 2000 meter climb up the HC ("hors categorie" or "too hard to categorize") Col de la Madeleine. The middle of the course was another HC climb with a little downhill, a second peak, and a steep descent full of hairpin turns. Then the last 20 km were straight uphill to the finish line. That's a total of 5,000 meters (or 16,404 feet) of climbing. If there were ever a day for defending champ Cadel Evans to attack and gain back the time he lost to yellow-jersey-holder Bradley Wiggins in the Stage 9 time trial, this was it. But we should backtrack for a second. The Stage 9 time trial, in which the British Wiggins extended his lead over the Australian Evans to one minute and 53 seconds, was on Monday. Tuesday was a rest day, and then yesterday's Stage 10, the first big stage in the Alps, basically ended with a status quo in the General Classification. There were big mountains to climb, but a long downhill at the end, and no way for anyone important to attack without getting reeled in quickly by the peloton. Attacks did come fast and furious, nonetheless, but they were mainly a way of testing how ready the British Team Sky was to defend Wiggins's yellow jersey. Very ready, it turned out. The Frenchman Thomas Voekler — who can always be counted on to make an exciting attack every year — won that one, and got the polka-dot jersey for being King of the Mountains (the best overall climber in the Tour), and we're all very happy for him. Today's stage began without Fabian Cancellara, who'd worn the yellow jersey for eight days this Tour, but decided to go back home to be with his pregnant wife before heading to London for the Olympics. A good move given that his only other chance for glory is the time trial in the penultimate stage of the Tour. This just makes me like him more. As expected, the attacks came immediately upon hitting the Col de la Madeleine, the first led by Robert Gesink of Rabobank. There were so many riders trying to make moves that it was hard to tell who was falling off the back of the lead group, who was trying to bridge the gap from the trailing peloton, and who was attacking off the front of the attack. It did make me happy to find that Johnny Hoogerland was among them, his legs permanently tattooed with a million scars from last year's horrific crash into a barbed wire fence. He slipped off the back after a while, but it was a good try. Oh yeah, and American Chris Horner was way up front, too, and seemed for a long time to be in a position to win the stage, until a mechanical issue forced him to pull over to the side of the road, delaying him for several minutes. 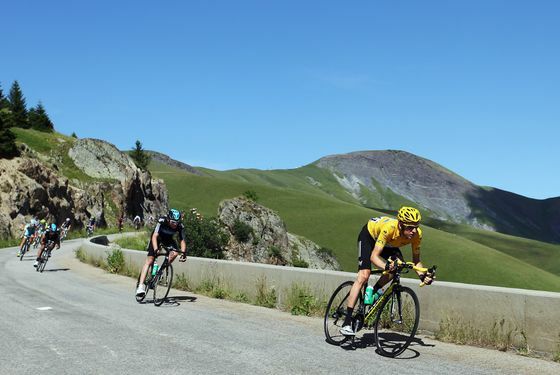 The first sign that Evans was going to try to make a move was when his young deputy, the new great American hope, 23 year-old Tejay Van Garderen, attacked the yellow-jersey group halfway up the second big climb of the day, the Col de la Croix de Fer. A minute later, at the 81 km mark, Evans was on the move and working with Van Garderen ahead of the pack. Wiggins and Team Sky upped the pace in the chase group, shedding all but eight riders. The Evans attack was doomed, though. First of all, it seemed like a weird place to attack. Why waste your energy building a gap halfway through the race instead of on the final climb when you could bring down the hammer and when Wiggins perhaps wouldn't have the juice to respond? As it was, Evans never got more than a fifteen-second lead going. Also, it wasn't clear if there was bad communication between Van Garderen and Evans, or if Van Garderen's legs were simply much fresher than Evans's. Either way, Van Garderen kept pulling ahead of Evans, when his job was really just to keep the highest pace possible that Evans could match and pull Evans up the mountain. Evans seemed to be yelling at him in the mike to slow down. They soon got swallowed up by the Wiggins group, having expended a ton of energy and having proved nothing except that Evans was having a bad day. As the race entered the final climb, only a few men remained out front with a lead of over three minutes on the yellow-jersey group, including Frenchmen Thibaut Pinot, the super young French rider who won Stage 8 with his team manager screaming at him out of the car the whole way, and Pierre Rolland, who'd somehow managed to chase back into the lead group after crashing on a hairpin turn down the final descent of the day. Within the yellow-jersey group, Vincenzo Nibali, the man in fourth place whom Wiggins had identified as the most credible threat to him besides Evans, launched an attack about 12 km from the end. Wiggins's right-hand man on Team Sky, Chris Froome, reeled him back. Nibali attacked again. And again. The last one stuck and he began to build a lead on Wiggins, who was hanging onto Froome's wheel just as Evans, who was looking not so great, was hanging onto Wiggins's. Froome began to lag, and Wiggins took off after Nibali himself. With 5 km left to go, it started to become clear who would fall victim to this mountain and who would not. Despite the setback of that minor crash, which had left him bleeding from the elbow, Rolland remained the sole man out front. Wiggins and Froome eventually caught up to Nibali. Behind them were a struggling Frank Schleck and Evans, who was really hurting and only staying in it because of the selfless help from his teammate Van Garderen. Then just as Nibali, Froome, and Wiggins seemed to be working together to eliminate Evans, Froome attacked that little group. It's unclear why, because Froome's job is to work for Wiggins and the move left Wiggins isolated and only served to prove that Wiggins couldn't keep up. Chaos ensued for a second, before Froome sat back and the little trio came back together while the Internet wondered if Wiggins would have to give Froome a talking-to when the ride was over (who's working for whom here???). Honestly, it was all terribly exciting. Rolland crossed the finish line first, 55 seconds ahead of Froome and Pinot, and 57 seconds ahead of Jurgen Van Den Broeck, Wiggins, and Nibali. Evans was 2:23 off the pace, as was Van Garderen, who likely could have finished up there with Froome, but instead was doing his job and stayed with his struggling team leader. Nibali has been trashing Wiggins in the press, but as they got off their bikes, they gave each other what seemed like genuine, appreciative hugs, presumably to thank the other for helping vanquish Evans. The shakeup in the overall standings is significant. Wiggins still leads the pack, two minutes and five seconds ahead of his young teammate Froome. Nibali has jumped to third, 2:23 back, while Evans is currently off the podium in fourth at 3:19 back. It seems his chances for defending his title are all but over. And Denis Menchov, who started off the day in fifth place, just behind Nibali, had a terrible day and is now in sixteenth place, 16:20 back. • Team Sky is now the dominant team of this Tour, with its two best riders in first and second place. They'll be working their butts off to defend those podium spots, but you can practically see their confidence building. Not only have they successfully defended the yellow jersey against multiple attacks and gotten their second banana into a podium position (for the time being) in the process, but they're on the verge of winning Britain's first-ever Tour de France title on the eve of London hosting the Olympics. Pretty significant motivators if you ask me. • We're seeing a changing of the guard. Last year's win may have been Evans's one and only, and I'm glad he got that win. He deserves it, but if he doesn't defend his title this time around, and if he never gets another real shot at winning one, no one's going to be surprised. Wiggins looks like he will win, but he's not an exciting rider, and it kind of feels like Evans's win last year: a deserved inevitability. Let's check that one off for him and then start rooting for the up-and-coming riders who really make our blood boil. • Those up-and-comers-to-watch don't include Nibali. He's exciting in the mountains, as his multiple attacks on the final climb proved, but he can't time trial anywhere near as well as Evans and Wiggins. He's not the future. • Froome and Van Garderen sure seem like they are the future, though. They both did extremely well in the Stage 9 Time Trial, and they're more than proving themselves in the mountains. Right now, their jobs as domestiques is to help their team leaders Wiggins and Evans secure victory, even if it means holding back and sacrificing their own spot in the standings. But between the time-trialing and the climbing, they're looking like the kind of all-around riders who could someday win the Tour. At several points today, both of those riders seemed to have power in their legs that their leaders did not. If they'd been allowed to stretch out and go it alone, would we have an entirely different Tour on our hands right now? We'll never know, but keep an eye on these two. We've found our replacement for the Contador-Schleck rivalry. As for the race itself, you can probably doze off until next Wednesday or Thursday. Tomorrow's Stage 12, the last in the Alps, has some significant climbs, but ends with a very long rolling stretch to the end. Expect that to be won by a breakaway of insignificant riders (to the overall standings). Then there's stuff for the sprinters, a minor mountains stage, and a rest day. There won't be another chance for a real shakeup in the GC until we hit the Pyrenees in Stage 16 next Wednesday, with Stage 17's tough mountaintop finish likely proving decisive. Evans isn't totally out of it. He could still mount a comeback, if not for the title at least to reclaim a podium spot, and I kind of do wish that somehow Froome would falter to give Evans one last moment in the spotlight. Froome is young. Let him shine in a year when his job isn't trying to help another guy win.